This is sort of an indirect follow-up to the story I posted last week, Blood for the Dead. When I sat down to do this second round of Seven Deadly Sins prompts, I had a hard time choosing a second candidate for Gluttony. I was starting to think I would have to leave the series unfinished when the stroke of inspiration finally came. I had a fun time with this one and I hope you enjoy it! Summer had just begun its last song. Late afternoon still clung to the sun’s sweltering heat; though in a few hours, blistery wind would sweep through trees which had already begun to claim their first hints of autumn color. As the sun slid low in the sky, tiny pinpricks of light appeared and vanished as numerous bioluminescent insects began their evening activities. Azmih felt his way carefully down an incline, testing for loose rocks with his boots before committing his weight to each step. It would be best to find a camp site before full dark. There weren’t many night predators to worry about in this forest, despite its ancient and overgrown nature, but he didn’t want to take a tumble with so many hidden ravines close to the main road. He estimated he had two hours left before he would have to settle for whatever came to hand. It was flat at the base of the ridge, which allowed him to greatly increase his pace. Within a quarter of an hour he reached a dense ring of foliage that might just prove ideal, especially if there was a clearing on the other side. “There is an altar near here.” The voice, barely more than a whisper next to his ear, made the tiny hairs on the back of his neck stand on end. “There can’t be.” If there was a hint of desperation in his voice, who could blame him? The ritual was best performed when he had time to prepare; it was why he marked the locations of the sacred sites so diligently. Azmih closed his eyes. The sacred tenants of his order could not be ignored. Nor could they be circumvented. He wouldn’t even bother to ask. Necromancers had been punished for less. But he had not calculated for this. He could list numerous reasons not to bleed today; at least one of which was the job to which he was headed. He would need all of his strength when he arrived. “You can’t avoid them forever.” The voice was dry, humorless, but not chiding. He opened his eyes, though it wasn’t as if the owner of the voice would bother to point in the proper direction. He could already sense it; the jolt of power hanging in the air. It was old and thin; that was why he hadn’t noticed it sooner. But it was unmistakable. How long had it been since one of his kind traveled this way? He moved forward slowly, drawn by resignation to the inevitability of his fate. Standing still would change nothing, and trying to run would only condemn him to something far worse. But he almost wished she hadn’t warned him. He might have been able to make the last part of the journey without tearing his stomach to shreds. In his chest, Azmih’s heart burned like a dying star. The list of his sins was far too long. The last two spirits he met on his travels had been too wild for him to tame, though he had almost spent himself on both the tasks. And there was still the matter of the rubies buried deep in his leather pouch. What to do with them, he was still unsure, and what would happen to them when he was gone, he didn’t want to contemplate. His oath demanded he bleed for every duty left incomplete, no matter the circumstances. Often, he avoided the altars until he could double back and complete his duties, but that had not been possible, for various reasons. He still had not found the answer to the second spirit’s troubles and the first was so far out of his way it would take ages for him to return and finish the job. Some of his recent failures were far more difficult to quantify than the simple, straight-forward failures of his youth. When had doing Death’s work become so complicated? There was a wild, primordial sort of beauty to this section of forest, more so than the other regions. As if the trees had formed a protective barrier around the most sacred portion of their lands. And though he was forced to lean heavily on their trunks as he stepped around their gnarled roots, they almost seemed to part for him, bowing to the gentle breeze, lifting their branches to accommodate his passage. He could tell the moment he reached the clearing why he hadn’t been aware of this particular altar. It was made of stone, so worn by weather they had become little more than a pile of boulders. The grass was so high the platform was lost to memory and the stones were so covered in moss and ivy, he wondered how he would reach the inscriptions without damaging the plant life; if there were any inscriptions left to find. But when he reached the circle of standing stones, he realized with dismay that the channels cut into the rock were still clear – as though the plants had refused to touch them with root or leaf. Azmih set his hands against the rounded edge of the slab and lifted his face to the sky. The last of the day’s sunlight filtered through the canopy and it was hard not to imagine it was the last sunlight he would ever see. He let the breeze wash over him, inhaling the soft scent of soil and late-blooming flowers. Then he reached down and drew the ritual dagger from the sheath at his side. He had never before hesitated when he laid the blade against his wrist. Azmih exhaled and allowed the blade to bite his flesh. Azmih nodded to show that he would. “Whatever awaits you on the path ahead, whatever bond you forge after today, remember that Death is hungry. She feeds on the souls of the living in the same way that we eat bread. Our ends fill and fuel her. Death is a harsh mistress and her rewards are fleeting. It would be wise to keep that in mind. It is possible to serve with absolute devotion and still need to protect yourself, on occasion. For nearly a thousand years, Azmih held those words close to his heart. In his darkest hours, he had lived by them. But he had miscalculated; he had not realized there were altars the order had ceased to mark long before his initiation. Azmih’s Death regarded him with dismay. She had been confident being both an extension of his mistress and an extension of Azmih himself would grant her assessment of his efforts some weight. After all, she had witnessed his struggles over the past few months, had fought by his side to fulfill duties well beyond either of their power. If the powers that be could see through her eyes, they knew that he had not forsaken his duty, merely delayed it until he acquired the knowledge and wisdom necessary to fulfill it. Yet the blood flowed faster than ever it had before, and longer than she thought possible. She had taken her fill, but still the blood continued to flow. Hunger burned inside her as she watched the tiny red rivers fill the grey space between ivy and moss, dark and sinister against the verdant life that filled the clearing. The desire to devour every ounce of her companion’s life essence was enough to drive her mad. Something in her being claimed that it would sustain her, grant her the eternal life and power she needed to be his guide, but she howled in the vaults of her mind that she would have no existence at all if she extinguished the fire of Azmih’s life. She was tied to him, inextricably. If he died, she would expire to fulfill her purpose. But she could not heal his wounds until the ritual was over, try though she did, pressing her pale fingers over the wounds, willing her power to answer. Finally, she turned her face toward the darkening sky, letting her cry of outrage and despair fill the forest. Birds shot from their perches, squawking as they fled. Insects ceased their chirruping and every creature that might have made a noise fled as deep into their dens as possible, leaving her alone with her sorrow. She was not mortal, and she could not shed tears, but her soul ached none-the-less. Above the canopy, the sky was clear. This was no gathering storm, no unexpected earthquake or falling tree. This was an answer her demand. When the dark seams appeared on the ground, like a mouth opening to reveal jagged teeth, she screamed. 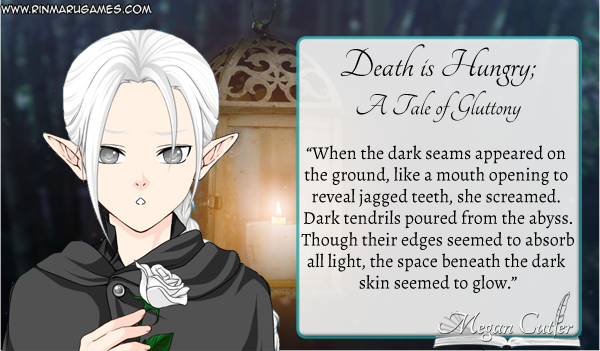 Wrapping her arms around Azmih’s shoulders, she drew him away from the altar, blood still trailing from the wounds in his wrists, desperate to keep him from falling into the newly opened abyss. Dark tendrils poured from the abyss. Though their edges seemed to absorb all light, the space beneath the dark skin seemed to glow, like a creature from the depths of the sea, terrible and beautiful all at once. She hugged Azmih closer, defiant to the last, even as one of those tentacles wrapped around his limp arm. She did not so much hear the voice as she felt it, reverberating through her entire being. Compelled by that command, she relaxed, letting Azmih slump into her lap. She would lose him now; she was certain. And she would be powerless to resist in the face of her creator. Do you think I am blind to his efforts? He is one of my best. Even matched against his predecessors, he is exceptional. One certainly cannot fulfill the task on his own. He would be wise to realize that. The dark tendrils slid away from Azmih’s wrist, retreating back to the fissure from which they had risen. Beneath them, Azmih’s pale arms were unwounded; no scab, slit or scar remained to show that ever he had been damaged. She slid her fingers across the smooth flesh, feeling the reassuring pulse of his life through the veins beneath. I know how to reward the loyal. But this, too, shall have a cost. Azmih’s death said nothing. The tendrils vanished. With another rumble, and a groan, the opening in the earth mended itself, becoming a thin outline before it vanished. A warm breeze swept through the clearing, causing the long grass to sway. Gently, she set her companion on the ground, cushioning his head against a thick patch of moss. Then she rose and set her hands on the altar, absorbing what remained of his blood. As it filled her, the terrible hunger inside her eased. It was a very near thing, this outcome. She would not be able to make another such appeal. She returned to the necromancer’s side, scooped him into her arms and cradled his head in her lap. It was well after midnight when he woke, his eyes cracking open the barest of slits. A soft sound of surprise escaped his throat, summoning an unbidden smile to her lips. The tension leaked out of him and, within moments, he returned to sleep. But she caught the hint of suspicion in his eyes before he closed them and knew she had been caught in her lie.